(Newport, RI)- The J/70 WORLDS debrief from NORTH SAILS offers many lessons learned from what may have been the toughest regatta ever sailed by most teams. 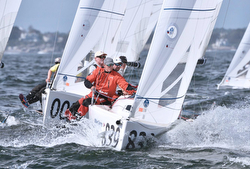 Eastern Yacht Club welcomed 91 teams from 18 different countries, and sailors had an exciting variety of conditions for the eleven races in four days. The allure of such an event was too much to pass up, and more than a dozen North Sails experts were on the starting line. Whether crewing for clients and friends or organizing their own team, the depth and expertise of our J/70 experts was on full display with many on the podium and even more in the top 10. NORTH SAILS asked some of the sailors in the event to share both their impressions and lessons from the J/70 Worlds. NORTH: Managing that many boats and keeping top finishes throughout the event is an impressive feat. What were the key things that you attribute the consistency Stampede was able to deliver? MAX: We knew going into the event that we had really good upwind speed. Having Tim Healy as our tuning partner throughout the summer was a big help with narrowing down rig tune/sail trim settings. Being able to use our speed to dig our way out of tough spots began to dictate our tactics . We always tried to start in low density areas somewhere near the middle of the favored half of the line, not being so leveraged to one side that we couldn’t dig our way out if the shift didn’t go our way. On race five we were persuaded to start at the windward end because the two previous races, hard right was really paying. We were able to win the start at the windward end and were first boat to tack to port, which was the race-winning move in the two previous races. Unfortunately, the left came in hard on the first beat and we rounded in the 50’s. We were able to fight back to the low thirties but the race still ended up being our drop race. We learned a lesson about risk / reward and stayed away from the ends for the remaining of the event using patience and speed to consistently get to the front of the fleet. NORTH: You are a boat speed guy. What were the keys to helping keep the boat going fast? ERIC: We had worked hard all summer on our rig settings, we had confidence of when to change the rig tension for the wind strength. I was trimming the jib and one interesting trim technique that we started during the worlds was that we rarely moved the jib lead. It lived in the #6 hole 95% of the time and we just used the halyard to adjust and jib sheet tension to fine tune the jib. In the heavy air races, when a lot more halyard was required, we had to ease the sheet about an inch and use the appropriate amount of in-hauler, less in the big puffs and more in the flatter, lighter spots. When it was lighter and we eased the halyard to make the jib fuller overall, it lowered the clew, effectively moving the lead aft, so we trimmed about an inch harder on the sheet and used more in-hauler. It seemed to work better as it is impossible to change the lead without tacking, but the halyard and sheet are readily accessible at all times. NORTH: How important was it to make sure your tuning was spot on and was there ever a time where the conditions didn’t match your setup and, if so, what effect did that have? ERIC: We always looked to set the boat up to be fast for the first half of the first beat so that we could hold a lane and get to the first weather mark in good shape. Most of the time it worked out but on the 4th day with all the rain squalls coming through and huge changes in velocity, after the first race we just went with a slightly tighter rig from base, +4 and +3, and used the backstay, traveler and boom vang much more aggressively. When the boat felt bad for Bruno, we made sure to remind him that we were out of tune and that he just had to deal with it! In the big fleet with lots of chop, in general it was better to get caught a little on the loose side than too tight. NORTH: After four days of racing and 11 races the top three teams all had over 100 points and were within three points of each other. Your team had some big scores early in the event. What turned the week around for your team to get back to the top of the leaderboard? ALLAN: For sure the regatta didn’t start as we hoped. The big thing for us was not to panic and to take a look at everything to see where we could improve. We talked to our training partners and other folks and realized we had to be more drastic in our rig adjustments for the waves and wind. It was a hard event. It was not easy to get finishes in the 20’s. The regatta was a good lesson in the fighting until the end and that the event is never over, till it’s over. If you would have told me that we would start with 18,22,25 and go into the last day three points out of the lead, I would have said you are nuts. It proved that World Championships are marathons and you have to keep pushing. Our team did that well. We always kept adapting and trying new things. We were one of the few teams to use the North J-6 jib, and I think it was the right choice for us for sure. We found it gave us more range for the conditions there. It was a sail we were very comfortable with and we were glad we chose in the end. NORTH: Crewing for your friends, the Furnary Brothers, what setup did you find worked best to help them get in the groove to be consistently fast? ZEKE: We used the XCS-2 Mainsail and we busted out a J-2 High Clew for the first time at this regatta. We were extremely happy to find the transition to the J-2 High Clew to be quite easy. It’s a beautiful, forgiving sail with all the modes you need. We stuck pretty close to the North Tuning Guide and found the setup to have the power we needed to fight through the big waves and chop while being easy enough to de-power and keep the groove nice and wide for Scott on the helm. In the higher winds, we made sure to fine-tune our lowers so that there was no mast sag at the spreaders and if anything, a hint of poke to weather. This helped us achieve maximum head stay tension even when the main sheet had to be eased. Keeping the boat flat (both upwind and downwind) was HUGE. NORTH: The J/70 Worlds was a challenging regatta. What did your team do so well to get a top 10 finish and what needs work for next time so you don’t “leave any points on the water”? ZEKE: For sure this has to be the most challenging regatta I’ve ever competed in. The depth of talent was insane and the sheer number of boats made it all the more difficult. Not to mention some pretty wild conditions! I think every single team felt that they left a myriad of points on the table – I know we did. One thing we talked about as team before the regatta is that we wanted to play every decision in the race as if we were trying to just be top 20. We knew that if we averaged somewhere in the top 20, we’d be very happy with the result. So all our big picture game plans, tactical decisions, and boat handling maneuvers were made with conservative strategies, (except for the time we crashed into Tim Healy at the weather mark-Sorry, Boss). Scott and Evan Aras (main trimmer) did a fantastic job with starting and we knew that if we could be punched off the line, that would most likely get rid of about 50 boats that had bad starts. From there it was really just about lane management and looking for opportunities to put the boat in places where we could make gains. One thing that would really help us next time is continuing to improve on downwind modes. There are so many different modes to consider off the breeze and it’s amazing how much can be gained and lost by doing it correctly. NORTH: What did you learn about North’s standard J/70 designs this week that J/70 sailors should know when thinking about investing in new sails? TIM: We used the XCS-2 mainsail, J-2 High Clew jib and the AP-1 spinnaker. I chose them because I believe they are the fastest and most user friendly sails available. They allow for the power and speed to acceleration of the line in choppy conditions and to power up quickly out of tacks. The J-2 High Clew is slightly fuller than the J-6 and is less weather sheet dependent which, I feel, makes getting “top speed” trim correct more quickly and easily. It was used on many of the top ten boats. The J-6 is also an excellent sail finishing 1 point out of 1st in second and 3 points out of first in 3rd! The J-6 can create the same power as the J-2 High Clew with slightly more weather sheet. My recommendation to someone ready for a new set is to go with the J-2 High Clew for a more user friendly sail and the J-6 if you like to be more active with weather sheeting. Add to Flipboard Magazine.